East Texas Baptist sophomore forward Ashleigh Rondon (Carrollton, Texas) posted three goals and an assist, leading the Tigers to a 2-0 record on the road. Rondon scored the game-winner in double-overtime for a 1-0 victory at Louisiana College on Saturday. She also had two goals and an assist in ETBU’s 7-0 win at Belhaven. Sul Ross State junior midfielder Aylin Villalobos (El Paso, Texas) scored three goals as the Lady Lobos earned road wins over No. 20/24 UT Dallas and Howard Payne. She netted her fifth goal of the year on a breakaway from 20 yards out in the 12th minute in their 2-1 win over the Comets on Thursday. Villalobos then scored a pair of penalty kicks, including the game-winner in double overtime to lead SRSU to a 2-1 win over the Lady Jackets on Sunday. LeTourneau freshman goalkeeper Mackenzie Wilbanks (Frisco, Texas) posted a pair of shutouts for the YellowJackets, coming up with 10 saves on the road. She had four saves in a 2-0 victory at Louisiana College, followed by six saves in a 2-0 win at Belhaven. Mary Hardin-Baylor junior forward Chelsea Graham (Pasadena, Texas) helped the Cru to a 3-1 win over McMurry, scoring the equalizer and assisting the other two goals. She scored in the 16th minute, then contributed goals in the 36th and 88th minutes to seal the victory. LeTourneau senior forward Keely Hayden (Alvin, Texas) scored in both of the YellowJackets’ shutout victories including the game-winner against Belhaven. UT Tyler junior midfielder Mariah Harmon (Cibolo, Texas) recorded a goal and two assists in the Patriots 3-0 win at Ozarks. Concordia Texas sophomore midfielder Cayla Gonzalez (Austin, Texas) scored the game-winning goal in the 63rd minute in the Tornados’ 2-1 victory over McMurry. Mary Hardin-Baylor senior defender Sydney Rangel (Midlothian, Texas) helped the Cru to a 3-1 win over McMurry with the lone score coming as an own goal on the UMHB defense. Rangel and the Cru held the War Hawks to just seven shots. Sul Ross State senior goalkeeper Kelly Swenson (Austin, Texas) recorded 11 saves and had a goal against average of 0.94 while picking up wins over No. 20/24 UT Dallas and Howard Payne on the road. East Texas Baptist freshman goalie Maddie Rae (Haslet, Texas) collected two shutouts with a 7-0 win at Belhaven and a 1-0, double-overtime victory at Louisiana College. Rae racked up seven total saves, including three at LC and four against BU. UT Tyler sophomore goalkeeper Maya Dossing (Pflugerville, Texas) recorded two saves in the Patriots’ 3-0 victory at Ozarks. Ozarks junior goalkeeper Kiara Henry (Rogers, Ark.) recorded 10 saves in the Eagles’ 3-0 loss to UT Tyler. She moved into fifth place on the Eagles’ career save list. Concordia Texas sophomore goalkeeper Shelby Franco (Hurst, Texas) recorded 14 saves as the Tornados went 1-1 on the week. Hardin-Simmons sophomore running back Bryson Hammonds (Coleman, Texas) ran 14 times for 176 yards with two touchdowns against a Texas Lutheran defense that was only allowing 60 yards per game on the ground. Hammonds averaged 12.5 yards per carrying, which included a 77-yard TD, and caught two passes for 13 yards as the No. 9/11 Cowboys topped the Bulldogs 58-14. 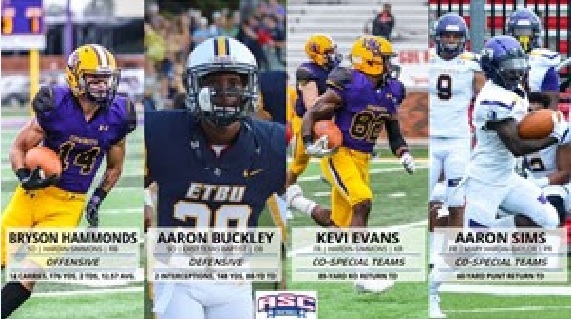 East Texas Baptist sophomore defensive back Aaron Buckley (Spring, Texas) came up with two critical interceptions in 24 seconds in the second quarter of the Tigers’ 48-27 victory at Louisiana College. With 24 seconds left in the first half, he intercepted the Wildcats’ pass and returned it 60 yards to the LC 5-yard line. The next play, ETBU threw an interception which led to the Wildcats driving to the Tiger 32-yard line. With six seconds left, Buckley picked off another pass and went 88 yards downs the sideline for a touchdown as the clock ran out, giving ETBU a 34-7 advantage. Hardin-Simmons freshman kick returner Kevi Evans (Mount Vernon, Texas) returned a kickoff 89 yards for a touchdown in the fourth quarter of the No. 9/11 Cowboys’ 58-14 victory against Texas Lutheran. Evans also had five catches for 106 yards and a touchdown. Mary Hardin-Baylor freshman punt returner Aaron Sims (Cameron, Texas) returned a punt 60 yards to give him back-to-back weeks with a touchdown return. He averaged 21.3 yards per return and also caught three passes for 13 yards in the No. 2/2 Cru’s 49-0 road win over Belhaven for his second consecutive Player of the Week award. Mary Hardin-Baylor senior running back Markeith Miller (Garland, Texas) rank for 138 yards and three touchdowns on just 18 carries as the No. 2/2 Cru defeated Belhaven 49-0 on the road. He averaged 7.7 yards per carrying and moved into third on UMHB’s career rushing yards list and second in touchdowns. Louisiana College senior wide receiver Drake Battaglia (Thibodaux, La.) had a big second half for the Wildcats with three touchdown receptions on consecutive drives in their loss to East Texas Baptist. He ended the night with seven catches for 144 yards, averaging 20.6 yards per catch. East Texas Baptist junior running back Jeremiah Robertson (Huntington, Texas) had a career night with 157 rushing yards on 17 carries with one touchdown in the Tigers’ 48-27 victory at Louisiana College. He busted out a 64-yard TD run to give ETBU a three-score lead in the second quarter. Robertson also had four kickoff returns for 94 yards, including a 54-yarder, and had a catch for 14 yards. Sul Ross State junior running back Williton Grear (Austin, Texas) netted 112 yards off of 15 carries with two touchdowns to help lead the Lobos to a 28-27 victory over visiting Howard Payne. Grear had a 39-yard TD run late in the second quarter and an 18-yard sprint in the third. Mary Hardin-Baylor junior cornerback Keith Gipson (Killeen, Texas) led the No. 2/2 Cru with six tackles and had a 40-yard touchdown on a lateral following a blocked field goal in a 49-0 road win at Belhaven. Gipson also added a tackled for a loss and a pass break-up as UMHB recorded its third consecutive shutout and held the Blazers to just 84 yards of total offense. Louisiana College junior defensive end T.J. Gray (Lake, Miss.) made five tackles behind the line of scrimmage for a total of 34 yards lost, including two sacks with two forced fumbles in the Wildcats’ loss to East Texas Baptist. He ended the night with 11 total tackles – seven solos. Hardin-Simmons senior cornerback Zac Richardson (The Woodlands, Texas) had seven tackles, forced a fumble and picked off a pass in the No. 9/11 Cowboys’ 58-14 victory over Texas Lutheran. East Texas Baptist sophomore kicker Drew Mackay (Forney, Texas) went 6-of-7 on extra points, recorded two tackles and averaged 53.0 yards on kickoffs in the Tigers’ 48-27 win at Louisiana College. RICHARDSON, Texas – UT Dallas and Mary Hardin-Baylor have been picked to repeat as the 2018-19 American Southwest Conference East and West Division winners, respectively, following a vote of the league’s head coaches, sports information directors, and select media members, the ASC office announced Thursday. UT Dallas (24-5, 16-2 ASC) received 77 points and eight of 14 first-place votes to lead the East Division. Polly Thomason, the ASC East Division Coach of the Year, and the Comets advanced to the second round of the NCAA Championship last season. Mary Hardin-Baylor (23-5, 14-3 ASC) was picked to win the West Division with 76 points and 12 out of 13 first-place votes. The Cru, under head coach Mark Morefield, were the runners-up at the ASC Championship a year ago. In the East, East Texas Baptist (25-7, 13-5 ASC) was picked second with 71 and five first-place votes after capturing the ASC Championship and advancing to the quarterfinals of the NCAA Championship. 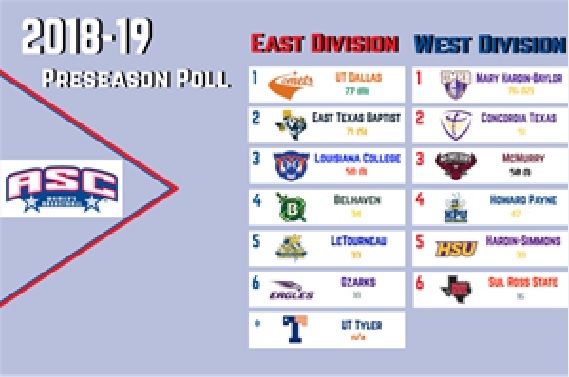 Louisiana College (14-11, 10-8) had one first-place vote with 58 points and picked third. Concordia Texas (15-12, 10-7 ASC) was selected as the runner-up in the West Division with 51 points. McMurry (13-12, 11-6 ASC) came in third in the poll with 50 points and one first-place vote. The 2018-19 ASC Women’s Basketball Watch List is composed of 33 players nominated by the head coaches and features three all-conference selections, 13 all-division recipients and three individual award winners. The 2018-19 season marks the 23rd in league history. Regular season play begins Thursday, November 8. The ASC membership will take on competition from 10 different NCAA Division III conferences, including – American Collegiate Athletic Association, Heartland Collegiate Athletic Conference, Liberty League, Northwest Conference, Southern Athletic Association, Southern California Intercollegiate Athletic Conference, Southern Collegiate Athletic Conference, St. Louis Intercollegiate Athletic Conference, University Athletic Association and USA South Athletic Conference. The ASC will also play members from NCAA Division I, Division II, NAIA, NCCAA, and USCAA. The three-day, eight-team, the single-elimination conference tournament is slated for February 21-23 at the site of the West Division No. 1 seed. 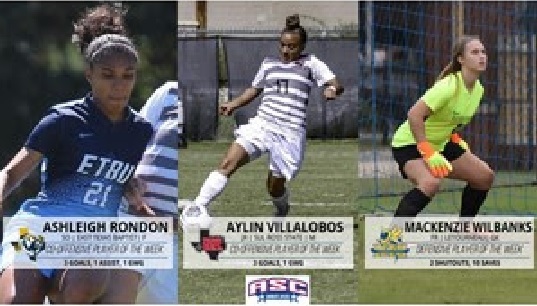 The ASC Championship Tournament features the top four seeds from both divisions. An automatic berth into the NCAA Division III Women’s Basketball Championship will be on the line. Hardin-Simmons senior Luke Smith (Montgomery, Texas) won the rain-shortened Alamo City Classic in San Antonio with a one-over 72 on Tuesday. He made a birdie on the 17th hole to win the title and give the Cowboys the team title by two strokes. 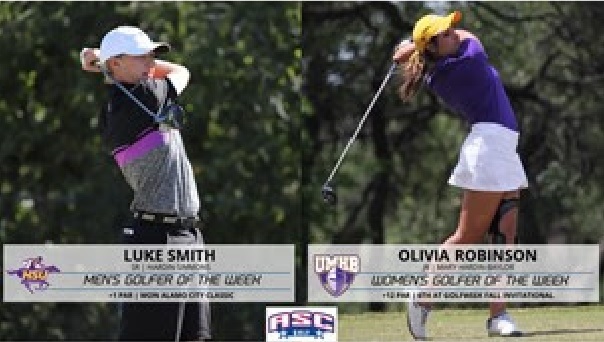 This is Smith’s second career Golfer of the Week award. Mary Hardin-Baylor junior Olivia Robinson (Pasadena, Texas) posted a sixth-place individual finish at the Golfweek Invitational in Florida, after shooting a 12 over par with a 72-79-77=228. She led the tournament after the first round with her even-par 72 at the top-tier tournament. This is the second career Golfer of the Week honors for Robinson. Concordia Texas freshman PJ Schmitz (Cedar Park, Texas) knocked in three birdies in the single-round Alamo City Classic on Tuesday, scoring a 75 and tying for third. Mary Hardin-Baylor sophomore Dustin Dingler (Crowley, Texas) was the top finisher for the Cru at the Golfweek Fall Invitational in Florida. He shot 11 over par with a 78-74-72=224, tying for 45th at the tournament that featured the top teams in the nation. Concordia Texas freshman Makaela Lauritsen (Lakeway, Texas) became the third golfer in Tornado history to win an individual title after shooting in 80 in the rain-shortened Alamo City Classic on Tuesday. Her performance helped Concordia win the team title.